"This is my go-to recipe for pot roast on a busy weekday. It uses inexpensive cuts of meat, made posh by the slow cooker. After years of tweaking others' recipes, I think I found a good mix of high-quality pot roast while still being very quick and easy." Arrange potatoes, carrots, and onion around the edges of a 5- to 6-quart slow cooker. Whisk celery soup and beef stew seasoning mix together in a bowl until smooth and creamy. Heat a saucepan over medium-high heat; cook roast until browned and seared, about 3 minutes per side. Sprinkle onion soup mix over entire roast and place roast in the center of the slow cooker, surrounding it with the vegetable mixture. Spread celery soup mixture over roast. Cook on Low, 8 to 10 hours. Remove roast from the slow cooker and place on cutting board; let rest for 10 minutes. Strain remaining liquid in the slow cooker into a bowl and whisk until smooth, about 1 minute. Slice roast and serve alongside vegetables and gravy. 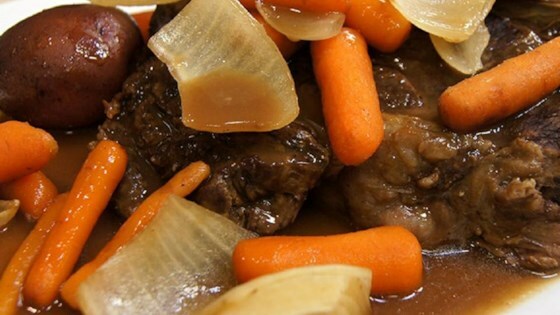 See how to make a tasty pot roast with just five ingredients. For smaller roasts or to reduce the sodium content, use only half of the onion soup mix on the top of the roast. Pot roast can also be shredded. Using two forks, shred the pot roast and remove any lingering globs of fat. Serve atop the vegetables covered in gravy. The meat and gravy were so yummy! Nobody in our family cared for the potatoes. Next time, we will try leaving the potatoes out and make mashed potatoes instead. One of the best slow cooker recipes ever! Added some extra minced garlic and will definitely make again! Very good and easy. I didn't brown my roast and it turned out great! A hit at the table!!!! This was outstanding! I made the recipe as written. After 8 hours, the meat was practically falling apart. I pre seasoned my roast with sea salt, Applewood rub, and onion powder. I also added chopped celery to the veggies, and put about a 1/2c of beef broth in the slow cooker.